You can adjust a survey's settings to ensure that it is easy for the respondents to answer. 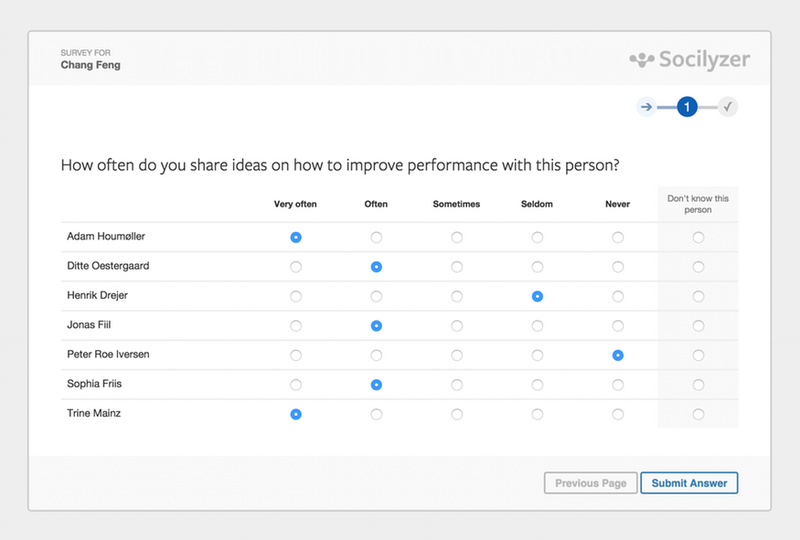 If no changes are made to the survey settings, a preselection page will be shown for the respondent to pick which people are relevant to him or her. 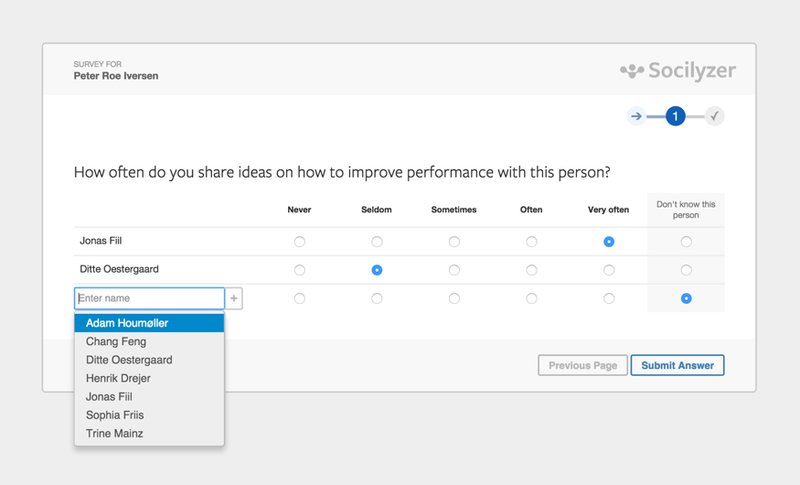 This setting is useful for surveys sent out to more than 10 people with more than 3 social network questions. Both of these would produce long surveys in terms of screen length if everyone has been preselected. On the downside, the preselection page is an additional page and it is not suitable for surveys that involve more than approx. 100 people. Showing groups will help the respondents to more easily identify relevant people on the preselection page, e.g., by showing departments. This setting is helpful for all surveys where the preselection is present and especially for surveys with more than 30 people. However, this setting will not be helpful if the groups are not immediately obvious to the respondent or not supposed to be shared - e.g. if the grouping attribute is sensitive like seniority or pay level. See the section on regrouping people by answers to traditional survey questions for an alternative way to analyze social networks with regards to such sensitive attributes. This setting works very well for larger network analyses (50+ people) as the survey is visually shorter. It skips the initial page where the respondents would otherwise preselect people they know who are. Instead people are identified by typing in their names. The field then displays all matching names (they do not have to be exact matches) to choose from. The feature can be combined with the "Allow Respondents to Add Others" and "Show Groups" settings too. 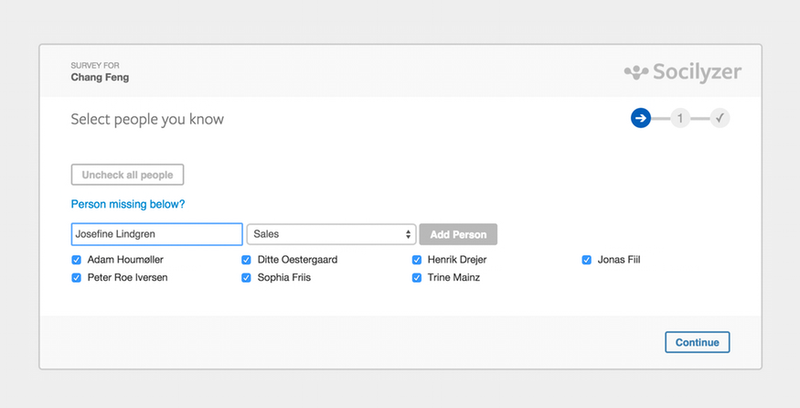 This setting will allow respondents to add people that have not been included already. When adding a person (s)he has to be added to an existing group associated with the study. Added people will not receive a survey (the survey creator can do this manually from the Projects page). Other respondents will also see the added person in their surveys. Instructions on who to include should be added to the message accompanying the surveys. This setting is useful if the social network is not easily defined in advance. 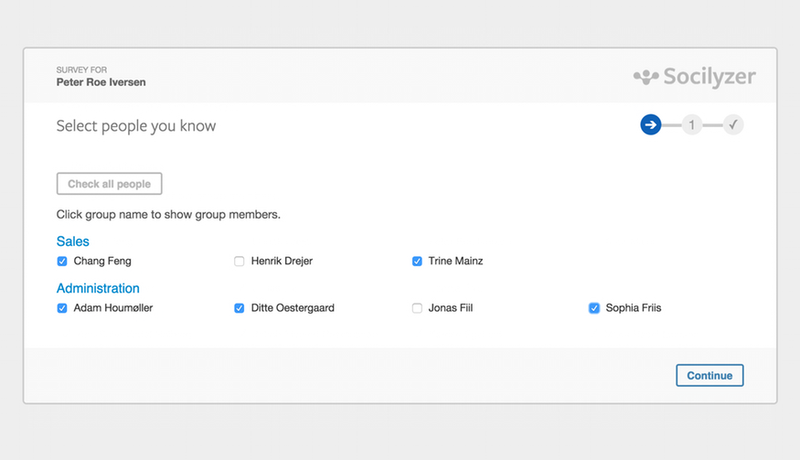 Do note that the group names will be visible when adding a person. Preferable the social network is well-defined from the beginning. All respondents will not have had the option to indicate a tie to a person who has been added mid-way through the survey. An email will be sent to each respondent with their own survey link. Each survey link is unique and should not be shared with others. The email's subject can be changed and the email's text should be updated with the background for the study, the deadline, and any instructions. This is an alternative to sending out the individual surveys via Socilyzer. 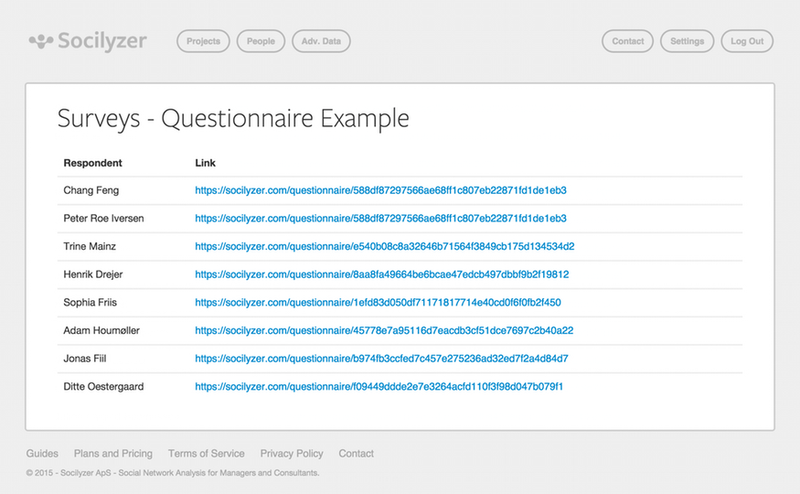 It will produce a list of personal survey links that is only accessible to the project creator and which can be used to write individual emails yourself. 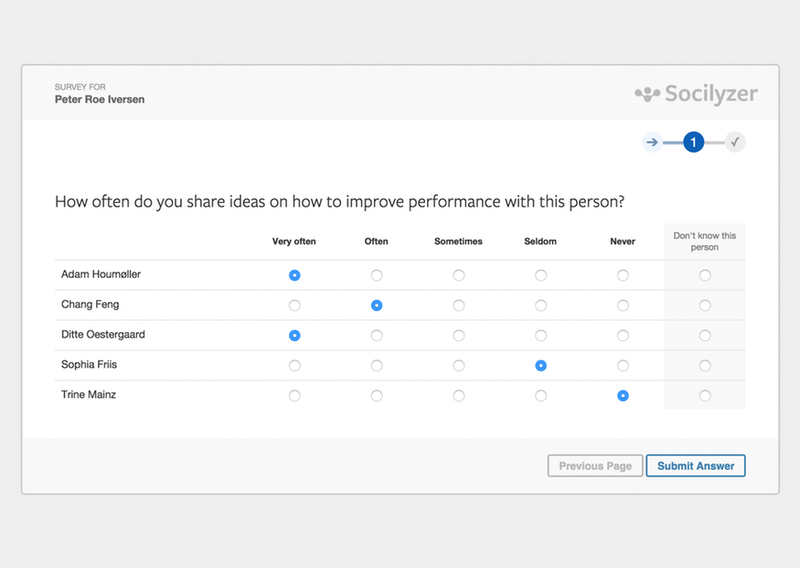 With one access pages, the individual surveys are linked to from one page. The benefit is that only one link has to be shared (e.g., in a newsletter or on a forum), however, the downside is that respondents can access each others' surveys. If a survey is accessed while it is being answered or before it is submitted, the answers are visible too. Personal emails will not be sent out. We do not recommend using this setting.